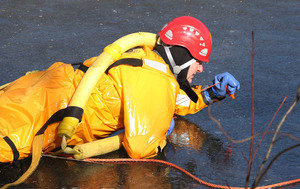 With many area lakes, ponds and reservoirs frozen over right now, Brewster firefighters are reminding people you never know how thick the ice is. With the proper tools and training, it’s crucial for firefighters to learn the basics of what to do when someone is in danger on the ice. 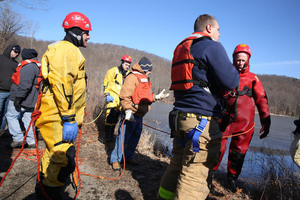 On Sunday morning, February 10, 2019, Brewster firefighters went to Haines Pond on Route 6 to practice their skills. Some firefighters wore bright red and yellow suits made out of a special insulated rubber. 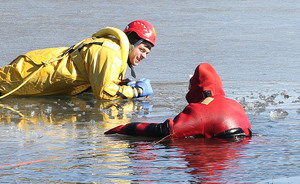 The suits protect firefighters from the elements, but also act as a flotation device. Firefighters practiced multiple scenarios according to Brewster Assistant Fire Chief Michael Bizzaro. “With the proper tools and training, it’s crucial for our firefighters to learn the basics of what to do when someone is in danger on the ice”, said Bizzaro. 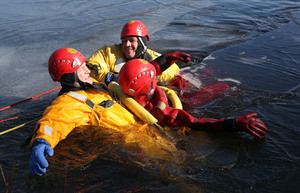 “We don’t have a lot of time to save someone before hypothermia sets in and their body shuts down, so it’s important that we learn to act fast, and that’s what we learned today” If you do fall in, firefighters suggest using your elbows to lift yourself up onto the ice and then kick with your legs to try and get your body out of the water.